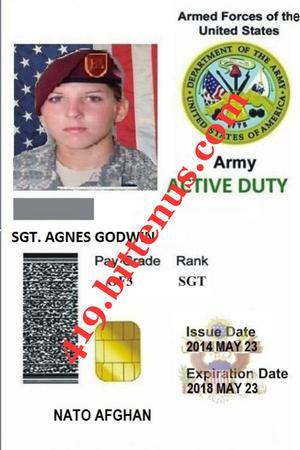 My Name is Agnes Godwin, i hope all is well with you? I am a soldier working as United Nations peace keeping troop in Afghanistan, on war against terrorism. 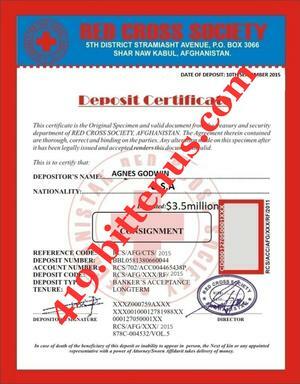 I have in my possession the sum of $3.5million USD Which i made here in Afghanistan, I deposited this money with a Red Cross agent. I want you to stand as my beneficiary and receive the fund and keep it safe so that as soon as am through with my mission here in Afghanistan,you will assist me to invest it in a good profitable venture, I will give you 50% of the total money for your assistance after you have receive the money. please reply back to me if you are willing to work with me so that i can send you the information where the money is been deposited your urgent reply is needed. Due to the United Nation policy on Afghanistan, there is a plan to move some troops out of Afghanistan so I will be among the people that will be moving out. I cannot take this money to the United States because since they know me as military personnel, they will want to know how I come about it. Due to this, I have made an arrangement for a Red Cross diplomat agent to move this fund. The question is who will be in charge of the money in my absence? This is exactly why I need your help. I want to guarantee you that you will not stand any risk in this as I have mapped out the strategy to have this box moved out of here safely Through Diplomatic means.you have to keep everything confidential till you receive the fund as a consignment or we can deposit it in bank to transfer direct to your account. Finally, I want you to stand as the beneficiary and receive the fund and keep it safe so that as soon as i come to your country, you will assist me to invest it in a good profitable venture,I will give you 50% of the total money for the assistance after you have receive the money. I believe I can trust you. Where we are now we can only communicate through our military communication facilities, which are secured so no body can monitor our emails, then I can explain in details to you. I will only reach you through email, because our calls might be monitored, I just have to be sure whom I am dealing with. Please if you can handle it, let me know so that i will furnish you on the way forward. Please send your information so that i will furnish you on the modality to follow. I am very impressed by your kind of person and i feel i have found the right person, but time will tell. As you know, the success of this transaction will depend on our total mutual trust. I pray to almighty God to take control so that everything will go smoothly. You don't have to be afraid of anything, i have made all the arrangement on how to carry out the transaction. I must not fail to explain to you how I came across this fund I want you to use for investment. Few days ago our soldiers had encounter and exchanged bullets with some gunmen and eventually three of our soldiers were injured in the event while over sixteen of the gunmen were killed, as a nurse in the army. I and my group rushed to give medical attention to our men who were injure at the spot where the sixteen gun men were shot to dead, I saw two trunks and showed it to my fellow and we decided to force of the trunks open and discovered huge amount of dollars in it and we did the same to the other trunk and saw the same thing and we quickly took the trunks and went in something like a cafe and counted the money and also shared it among ourselves and mine amounted to $3.5 Million us dollars which is the money I want us to invest in. Please re send your information so that i will furnish you on the modality to follow. Finally, I want you to stand as the beneficiary and receive the fund and keep it safe so that as soon as i come to your country, you will assist me to invest it in a good profitable venture, do not worry yourself i will give you 50% of the total money for the assistance after you have receive the money. May the almighty God continue to bless you and your family for your very kind and prompt response to my email,indicating your willingness to assist me transfer this funds for investment purposes in your country or any country that you will recommend. am well impressed by your person and I feel I have found the right person, but time will tell. As you know, the success of this transaction will depend on our total mutual trust. I want everything to be clear to you right now but you have to read carefully. Due to the United Nation policy on Afghanistan, there is a plan to move some troops out of Afghanistan so I will be among the people that will be moving out. I cannot take this money to the United States because since they know me as military personnel, they will want to know how I come about it. Due to this, I have made an arrangement for a Red Cross diplomat agent to move this fund. The question is who will be in charge of the money in my absence? This is exactly why I need your help. I want to guarantee you that you will not stand any risk in this as I have mapped out the strategy to have this box moved out of here safely Through Diplomatic means.you have to keep everything confidential till you receive the box.do not disclose it to any other person, for security reason. I have made all the arrangement on how to carry out the transaction, i will be in your country in two weeks time.Please make sure that you keep everything confidential till you receive the consignment box. The plan: The box will leave on board the Red Cross jet and arrive to Heathrow Airport in London on 18th of December 2015. Upon the arrival, I shall let you have the contact of the diplomat for you to reach an agreement with him on how and where the box will be delivered to you in your country. You shall let him have your full names, address of delivery and your phone numbers for him to make the necessary logistics involved. You must have to be aware that you are going to assist the diplomat to get the diplomatic yellow tag there in Heathrow Airport in London before he move down to your destination, the diplomat shall not have any doubt that the box belongs to you because I instructed at no time the box will be open or search.The diplomat shall make use of his diplomatic immunity to ensure that the box is delivered to you as a diplomatic package which shall be free from any form of check at the airport. The box: The box contains the money and will be protected with a pin code which I will make available to only you alone. You shall not in any case disclose the content of the box to the diplomat for security reasons. I told him that is your person belonging.That is why the diplomatic yellow tag is require from him. As soon as you receive the box and the pin code, you shall have in mind that your percentage will be 50% of the total sum while you shall ensure that my own percentage of 50% is intact.As soon as i come to your country, you will help me to invest it in a good profitable venture. I will contact you again as soon as the consignment arrive in Heathrow Airport in London and furnish you with the contact of the diplomat. can you travel to London and you will take the custody of this box so that you will have the money pay in to your account direct.?? How are you today, i hope fine. I want to let you know that the diplomat will be leaving Kabul, Afghanistan midnight today, to arrive Heathrow London airport tomorrow morning, before he will fly down to airport to deliver my box to you. I will send you the security code number of the box immediately the diplomat delivered my box to you, i have also passed your details to the Red cross diplomat, he will contact you immediately he arrive to London airport, so that you will assist him in getting him a yellow tag, that will enable him to leave London airport immediately, and start coming to your country to deliver my box to you. The diplomat will get in contact with you when he arrive to your airport, so that you will direct him where to come and deliver my box to you. I have already passed your details to him, so that he will call you when he arrive to London airport, before he proceed to your country to deliver my box to you. Finally, i want you to send me your telephone number, also your nearest airport. And where you want the diplomat to come and deliver my box to you immediately he arrive airport, Let me stop here for now, have a nice day. God bless you. I just want to informed you that the consignment box had arrived to Heathrow airport in London this morning, please contact the diplomat who is now in London airport with the consignment box. Contact of the diplomat is as follows. Please contact him immediately and update me on the development, bear in mind that the diplomat does not know the actual content of the consignment box, so do not disclose the content to him, for security reason. I pray almighty God so that everything will go smoothly. The code number will be send to you as soon as you finalize with the diplomat. The diplomat will direct you on what to do, base on how to get the diplomatic yellow tag to enable him to clear the consignment box over there in London airport, to enable him start moving down to your destination, contact him now because he is in Heathrow London airport with the consignment box. This is to informed you that am still here in Heathrow London airport, Miss. Agnes Godwin, has instructed me to deliver her consignment box to you in , i just arrived London airport early hours today. Upon arrival of the consignment, there is a little problem that is the reason you have not heard from me. The customs Authority is demanding £920 British pound, for the diplomatic yellow tag fee of the box which i explained everything to him, the content of the consignment box is undisclosed, that's why it required the diplomatic yellow tag. Please I would not want you to keep me waiting for too long. An immediate payment of required charges to secure the diplomatic yellow tag is needed to be paid. After the payment, the customs will release the box to me, then l fly down to your country Immediately. Below bill for the logistics. Diplomatic yellow tag ------£920 British pound, which is equivalent to 1,430 us dollars, You have to go to the money gram Intentional to Send me the money, with my information below. You have to ensure that you avail me with the Money gram International transfer control number (MTCN) for easy access to the money. Once I receive this money, I shall immediately commence on all the necessary logistics to ensure that I provide the box to you. Please be informed that I must be mobilized with the above mentioned bill before my departure as I have been told by Miss. Agnes Godwin that the box belongs to you. Thanks for your anticipate also call me. 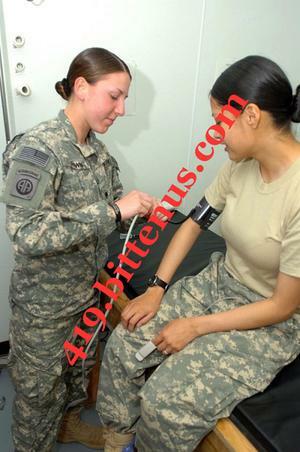 It is my pleasure to write you, Am Sgt Agnes Godwin the young America lady who pleaded and asked you to help her out in getting the consignment from Afghanistan. I thank God and i wish to let you know am still alive and in good health, Also tell you about my success in getting those consignment box transferred under the good co operation and trust of my new partner from Norway into his country here in Norway. Presently I am in Norway now for investment projects with the help of my new partner\ Husband (Prof. Sandro S.Carlos). Please do let me know immediately you receive the cheque from the Dr. Fernando Alvaro so that we can share the joy after all that we went through together. In the moment, I am very busy here because of the investment projects which I and my new partner are having at hand, finally, do not forget to extend my greetings to your family, i really missed you all, i hope i could come to your country and be with you and your family but i found it's never the will of God, so feel free to contact and get in touch with Dr.Fernando Alvaro immediately for him to send and deliver the cheque to you without any delay. Thanks once again Dearest.